The government’s efforts on cybersecurity are intimately connected to terrorist threats. Mobile and cloud computing raise a host of issues not explicitly addressed by cybersecurity proposals. DNSChanger Doomsday? Not on Monday. July Fireworks: Senate May Take Up Cybersecurity, But Then What? 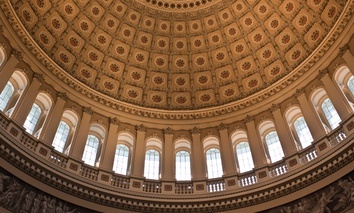 Even if a bill gets through the Senate, the path forward is unclear. The malware has been described as the most sophisticated code researchers have yet seen. Are We Experiencing a Cybersecurity Ebb Tide? Cybersecurity legislation slowing in the Senate should leave us wondering if interest in the subject is receding for a time. Too often, cybersecurity requirements are viewed as impediments to progress. In January, an Internet phenomenon never experienced in D.C. before lead to the presumed death of two bills: the Stop Online Piracy Act (SOPA) in the House and the Protection IP Act (PIPA) in the Senate. What Role Should Government Play in Securing Cyberspace? Cybersecurity is Coming! Cybersecurity is Coming! As widely reported, next week will be busy as the House takes up a series (probably) of cybersecurity bills as part of the House Republican Leadership's designated "Cybersecurity Week." New York Blackouts -- Deja Vu? In the last couple of days, a number of blogs and stories have popped up questioning whether the Senate cybersecurity legislation to be introduced next week incorporates the ill-fated SOPA/PIPA legislation or is somehow going to harm the Internet as many claimed SOPA/PIPA would. Cybersecurity - What are the Real Privacy Concerns? President's Challenge Site: Temporarily Hack[y] Sacked?